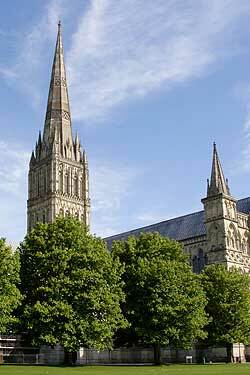 Now physically dominated by the soaring spire of its cathedral, the City of Salisbury's history can be traced back several thousand years to include the Iron Age hill fort and settlements at neighbouring Old Sarum ('Old Salisbury') and just a few miles further away Stonehenge and Avebury. A charming small city, Salisbury's main attractions include Old Sarum itself, the Cathedral (which was predominately constructed between 1220 and 1320 and incorporates the tallest spire in the UK, reaching over 400ft as well as being home to one of the fours surviving copies of the Magna Carta) and surrounding museums and historic houses that make up Cathedral Close. Salisbury can be visited either on an airport transfer tour (when travelling to or from your Bath or West of England destination and a London airport), on one of Celtic Horizon's suggested tour routes or build it in to a custom tour around your own requirements - contact us for details and prices.